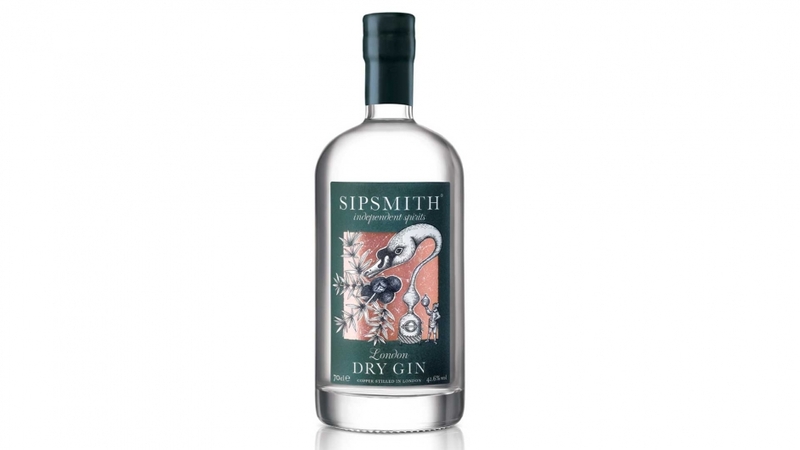 Born over 200 years ago in the UK, Sipsmith is a complex gin made from ingredients sourced from all over the world (Macedonian juniper berries, Bulgarian coriander seeds, Sevillian orange, Spanish licorice root, Chinese cassia bark). It’s smooth enough for a martini, yet rich enough for the perfect British G&T. Available in crystal clear and whipped cream, this German vodka undergoes an ice filtration process to give it a clean flavour. Best for shots, or drinking on the rocks. Available at most liquor shops across India. Brought to India by the makers of Cobra beer, this is one of the best-selling lagers in the UK. Light with a sweet hoppy taste, it’s best for afternoon drinking in front of the TV. Available at most liquor shops across India. 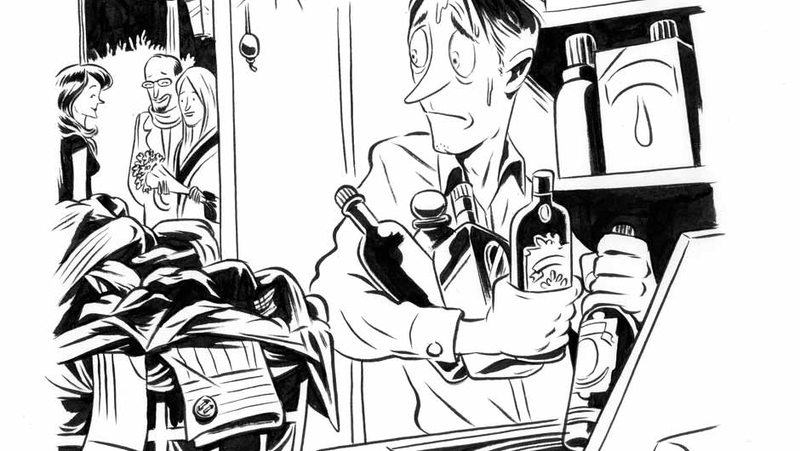 No man’s home is complete without a well-stocked bar, but what exactly is that supposed to mean? But the other end of the spectrum – not much money, tons of restraint – isn’t all that bad, either. We call this collection the Core, because it’s these liquors that should be the base of your bar. 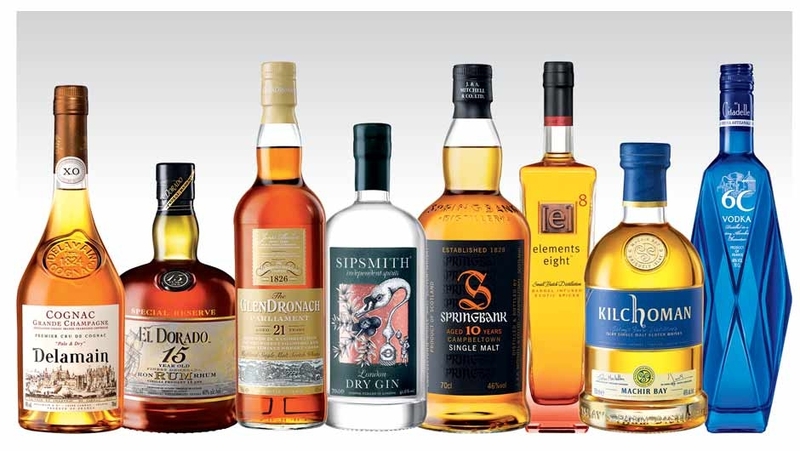 Whisky, gin, vodka and rum give you a totally unassailable selection of drinks. Then you’ll need sweet and dry vermouth, for Manhattans and martinis; a bottle of bitters; and always, always fresh citrus. From there, start growing – but be selective. El Dorado rum (and a bottle of ginger beer) will help you quench your Dark ’n’ Stormy craving. A good cognac like Delamain and any Islay scotch will satisfy the people in your life who like to drink things neat. Tequila and triple sec are necessary if you’re a margarita man. Most bar nerds will insist on Campari, but we think Gran Classico — a Swiss-made variation — makes for a better Negroni. Whether you want absinthe is up to you, but how are you supposed to rinse a Sazerac glass without it? Even if your bar is a tiny cabinet in your living room, you’re going to want to have that one outlier bottle that will not only make you look well-stocked, but a bottle that will get you laid, like a local vodka from somewhere in Poland or, a bottle of Caroni Caribbean rum. 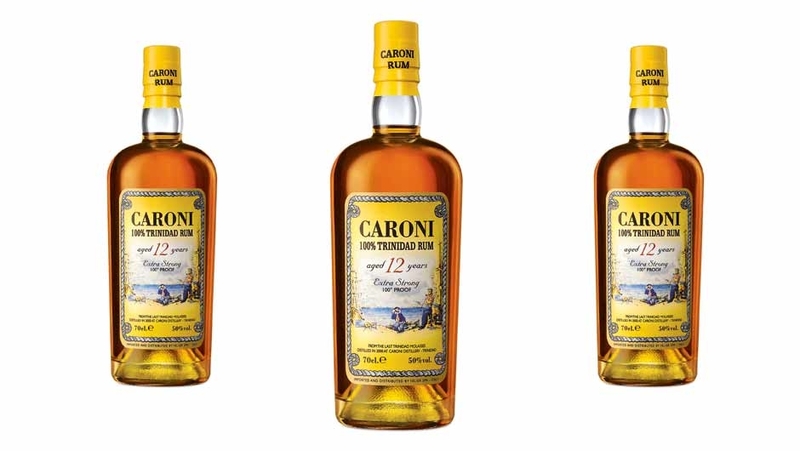 The distillery has been dismantled and an Italian baron-type figure has control of every last barrel, which experts say will run out in about three years. This rum tastes like burnt tyres sitting out in a tropical sun, but in a good way that’s from charred molasses and the flavors are best set off with some orange rind. Now, finish up and come to bed, darling. 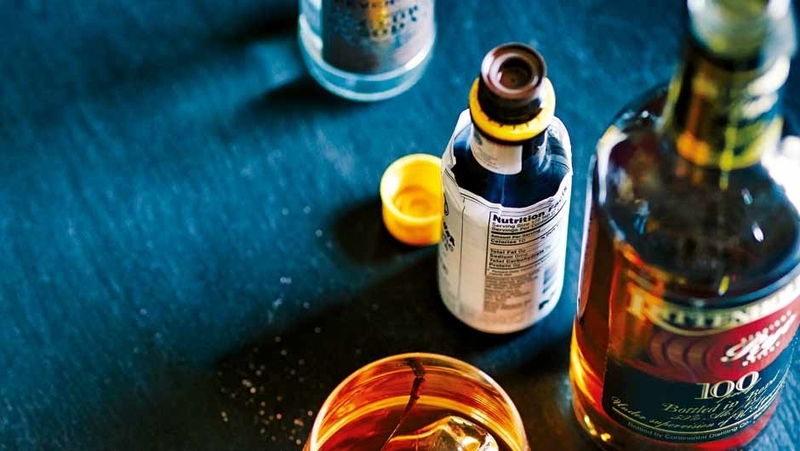 In the world of cocktails, all that matters is volume; mixed liquor doesn’t need to swirl or breathe. So you should have some four-ounce glasses, for sipping; some four- to eight-ounce short glasses, for lowball cocktails; and some tall eight-ounce glasses, for ice-loaded highballs. 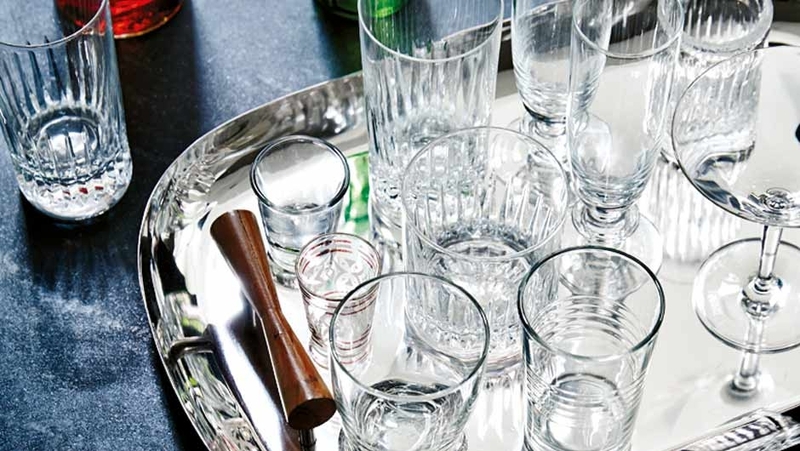 Best practice: If you see a glass you like, buy one. Just one. Then repeat until your cupboard’s full. What bitters are – concentrated botanicals preserved in alcohol- is less important than what they’re capable of. Which is, basically, making a brand new drink out of the same recipe. Take the Old Fashioned. Sub in Regans’ Orange Bitters for Angostura and you plug an amplifier into the drink’s circus note. Bittermens Burlesque will make it sour and a tad spicy. And Dutch’s Colonial Cocktail Bitters, made with hand-harvested flowers and berries, gives the Old Fashioned a dash of pepper and a whole fistful of floral. But be selective. As with automobiles, if you have more than three, you’re just showing off. I’ve got my bar. And then I’ve got my Pappy Van Winkle. You may have a bottle or two like this – an old scotch, or maybe a pricey bottle you picked up while travelling. Something that gets secreted away when people come over. I keep mine in my clothes hamper, next to my undies. Am I proud of this? Maybe not so much. But it’s necessary. I don’t need my friends helping themselves whenever they’re over for dinner – and I don’t want to explain why it’s just not the right time, every time. There’s no shame in keeping your best bottle under wraps. The only shame would be never getting around to drinking it. 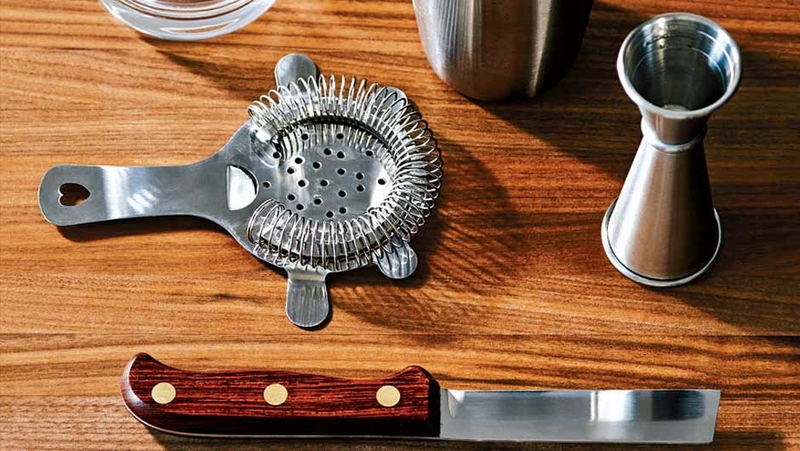 There are about six tools you need to make drinks, and none should come with batteries. Start with a Parisian shaker and a crystal Yarai mixing glass, for shaking and stirring, respectively. You’ll need a strainer, too, for seeds and pulp. Get a jigger with one-ounce and two-ounce sides and a stirring spoon with some weight to it. (It’ll be easier to twirl.) And then settle on a paring knife that feels good in your hand. This one – with a squared-off edge – is specifically designed for dealing with citrus. You will be dealing with a lot of citrus.